REDDING, Calif. - Simpson University graduate JoAnn Dunbar takes the prize for farthest distance traveled to walk to the stage April 26 with 199 other students receiving their diplomas. Dunbar, who earned her Master of Arts in Education, flew from Seoul, South Korea, to attend the outdoor morning ceremony. Originally from Canada, Dunbar has lived in Korea for 12 years, teaching ESL (English as a Second Language) and language arts classes at Seoul Foreign School. There, she took advantage of a master’s program Simpson University offered for a few years starting in 2008. Professors from Simpson’s School of Education—including Drs. Richard Harris, Ron McGraw, Glee Brooks, Paul Jones, and Carol Wertz—took turns traveling overseas to teach courses and continued to provide online instruction after the location in Korea was closed. The teachers they trained—such as Dunbar—came from around the world. She decided to attend graduation in person for several reasons. As an undergraduate at a 30,000-student university, she had not participated in the commencement ceremony, and she knew her parents, Bob and Bonnie Dunbar of Alberta, Canada, wanted to see her cross the stage. “When I asked the education professors if I could come to Redding, they said, ‘of course,’” she said. More than 40 students have received their M.A. in Education from Simpson while living in Korea through a combination of on-site and distance-education courses. 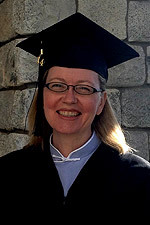 Many of those graduates stay connected to Simpson, noted Dr. Glee Brooks, dean of the School of Education. Some have come to Redding to earn teaching credentials or TESOL (Teacher English to Speakers of Other Languages) certificates. The program fostered lasting relationships and gave Simpson professors a greater respect for the Korean people and their culture, Dr. Brooks said.